Thank you for joining me as we count down to the next MFT release. We are four days away from the big day! All the new Stamps, Die-namics, and Stencils will be available on Tuesday, February 3 at 10:00pm EST. Be sure to check out the MFT Blog to see all the new items being revealed today. Don't forget to leave a comment on the MFT Blog. Countdown posts, YOU could win one of the five $75.00 gift vouchers. I have two fun cards to share with you tonight. 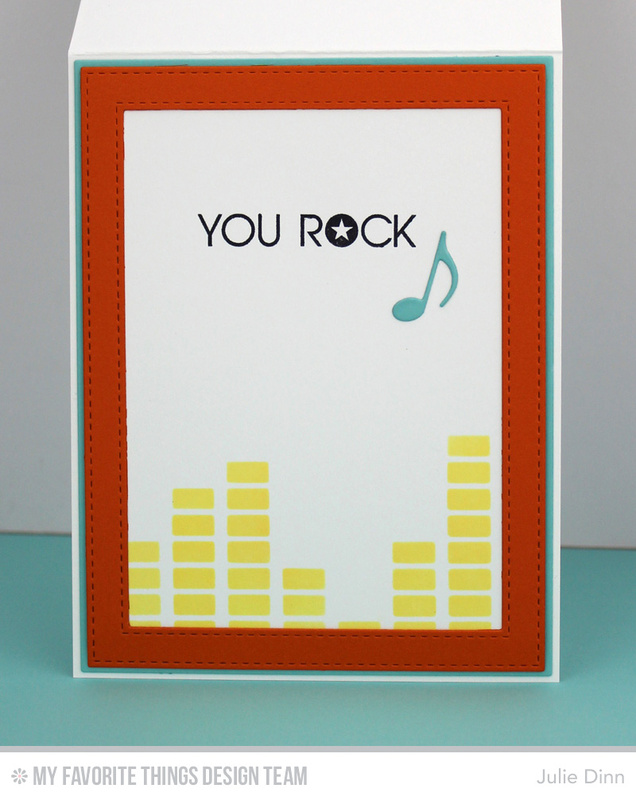 The first one features the new MP3 Player Die-namics, Keep on Rockin' stamp set, and the Equalizer Stencil. It also features a few of the fabulous new colours! I used Lemon Chiffon Premium Dye Ink with the Equalizer Stencil on Smooth White card stock. I stamped the sentiment from Keep On Rockin' in Black Licorice Hybrid Ink. 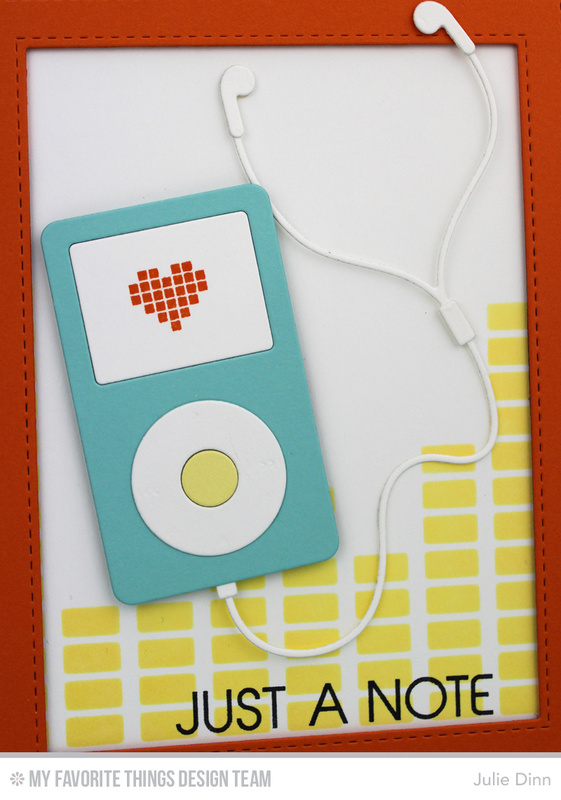 The oh so cute, MP3 player was die-cut in Summer Splash card stock. The large Stitched Rectangle Frame was done in Orange Zest card stock. 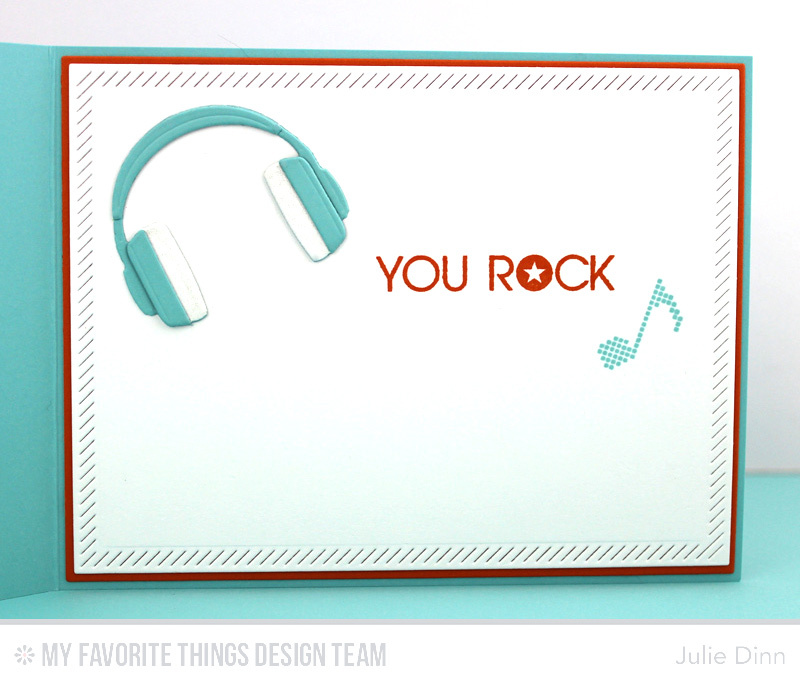 On the inside of the card, I stamped another sentiment from the Keep On Rockin' stamp set. This set is full of fabulous and fun sentiments! 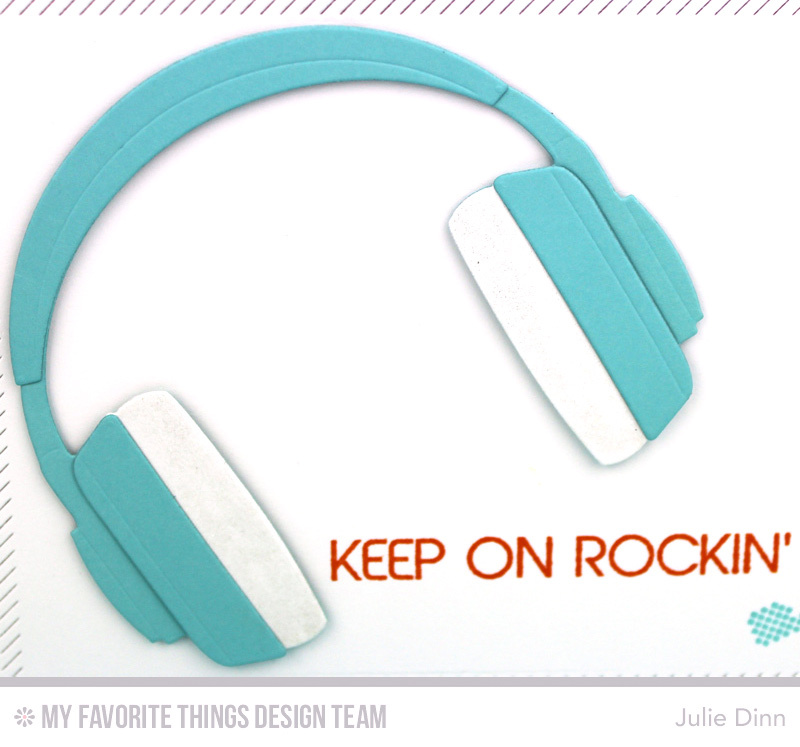 My next card features the rocking' new Headphones Die-namics and the Inside & Out Diagonal Stitched Rectangle STAX Die-namics. 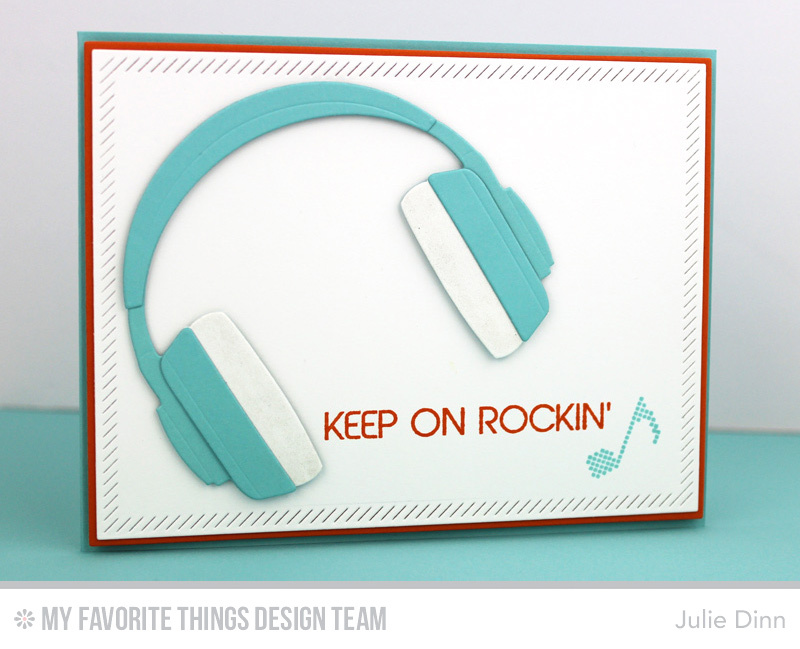 The headphones were die-cut in Summer Splash and Smooth White card stock. The Smooth White card stock was given a little sparkle with the Wink of Stella Pen. The Headphones Die-namics also includes a smaller version of the headphones. These are perfect to add as an accent to the inside of your cards. Fab job. All the colors on the card make them so fun!! these are crazy awesome! I just love them all - can't wait until the release! Your talent is such an inspiration!!! Such GREAT cards Julie - LOVE them all!!!! Julie, I love your cards! 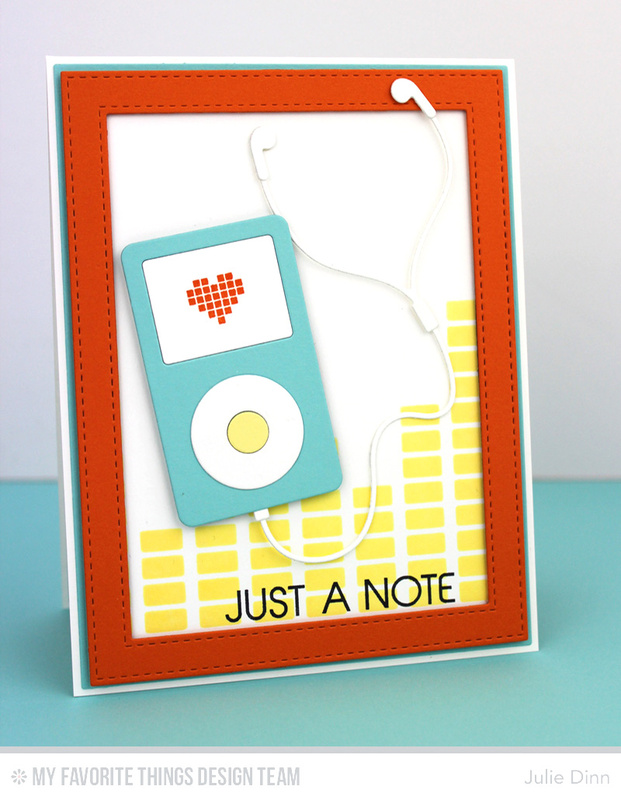 The sentiment "just a note" is so sweet! And using the smaller headphones inside with the note is lovely! The heart on the mp3 player is great. Great card and colors. These are the cutest dies ever. Card card ideas. Can't wait to buy. Love the headphones.